An FBI Identification or Department of Justice Record search is a listing of certain information taken from fingerprint check submissions retained by the FBI in connection with arrests and, in some instances, federal employment, naturalization, or military service. How is the fingerprint check conducted? A trained and certified technician will scan the applicant’s fingerprint. The electronic fingerprinting session takes five to ten minutes and the prints are immediately sent via electronic transmission to the Department of Justice for background processing. The DOJ uses the fingerprint images to search any matches in their fingerprint database. If a match is found, a technician will take a closer look at the fingerprint check and determine if it is a true match. This could mean a slightly longer processing time, but it ensures the accuracy of the results. What information is included in a fingerprint background check? If the fingerprints are related to an arrest, the fingerprint background check includes name of the agency that submitted the fingerprints to the FBI, the date of the arrest, the arrest charge, and the disposition of the arrest, if known to the FBI. All arrest data included in an identification record is obtained from fingerprint submissions, disposition reports, and other information submitted by agencies having criminal justice responsibilities. Should you order a fingerprint check? 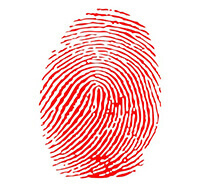 A fingerprint background check is usually used for hiring employees that will have a position of trust. For instance, employees working with vulnerable citizens like the elderly or children should be verified as thoroughly as possible so as not to jeopardize the safety and integrity of the workplace. The fingerprint check is usually ordered along with a nationwide or local county background check, given that the fingerprint databases are related to the FBI and DOJ, not local crimes.